Established in 1834, Enterprise was once the most prominent community in Clarke County, serving as the county seat and enjoying fame as a progressive place in the antebellum period. A middle class neighborhood of single-family homes was developed in East Enterprise between 1855 and 1935 with the greatest building activity occurring in 1855. Another building spree took place from 1895 to 1910. These two distinct phases of construction reflect the time when the Mobile & Ohio Railroad was built through the area and when Clarke County’s lumber industry began to develop. Enterprise’s population remained fairly steady during the postbellum period up to about 1912, but eventually declined. Many of the resources dating from Enterprise’s period of significance have been lost due to natural disasters, Civil War, demolition, and neglect. Others have been drastically altered over the years, thus losing their original integrity. This great loss increases the significance of the existing residential resources, which illustrate the progress and prosperity brought to the town and Clarke County at large by railroads and industry. The most intact and architecturally significant cluster of these resources is found in the East Enterprise Historic District. Circa 1850 • Greek Revival • Second house on County Road 367 on east side of Highway 11. This house is said to have served as the Federal Headquarters during the occupation of Enterprise, and its historical significance derives from this association. 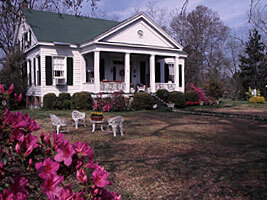 Riverside is architecturally significant as one of two, two-story Greek Revival plantation houses in Clarke County. 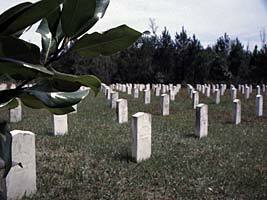 Lovely old cemetery with more than 400 soldiers buried here. Some monuments date to the 1700’s. Yellow-fever section. Originally established and cared for by Oddfellows. Overseen by Enterprise Woman’s Club since 1930. Circa 1890 • Queen Ann • 107 North River Road. Locally important example of rectilinear mode of Queen Anne style. The house retains a high degree of architectural integrity. Judged within the local context of Clarke County, it is important both for its architecture and as a symbol of the development patterns that occurred in West Enterprise because of the construction of the New Orleans and Northeastern Railroad in the 1880’s. Circa 1820 & 1860 • Greek Revival • River Road. 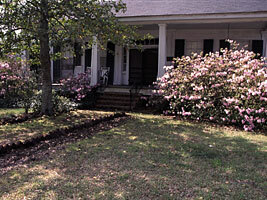 The site is said to have been the location of the Catholic Mission to the Choctaws. The rear gabled section with shed roof, constructed in 1820, originally had a log ell on its northeastern end that was supposedly a part of the Choctaw Mission. One of the most significant examples of the bungalow in Clarke County and thus a locally important work of early twentieth century residential design. On west side of N. River Road and second building from the northwest corner of State Highway 513 and N. River Road. Circa 1856 Greek Revival vernacular • River Road. Local legend says this was the Choctaw village site. The street on which this house lies was originally lined with Indian wigwams. Circa 1856 • Greek Revival • Olliphant Street. This house is still known as the Parsonage House. The first Methodist Church was on a lot behind this house. The lot for the church was donated by Charles E. Mayeroff around 1830. 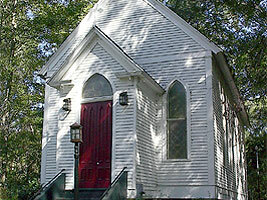 Historical significance comes from its long association with Enterprise Methodist Church. Circa 1850 • Greek Revival • River Road. 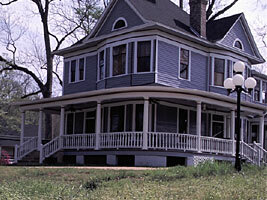 This home is said to have served as a hospital during the Civil War. It is one of the most architecturally significant of the antebellum houses of the county because it is a well-proportioned moderated-sized Greek Revival country residence. Circa 1820-1830 • Greek Revival • River Road. Cottage-style antebellum home. Said to have housed doctors and nurses working in the hospital in the Hunter-Frost House during the Civil War. Circa 1920 • Bungalow/Craftsman • Bridge Street (Highway 513). One of the most sophisticated articulations of the bungalow in Clarke County, thus a locally important work of early twentieth century residential design. It illustrates how the people of Clarke County preserved traditional architectural elements, incorporationg them into modern residential design. 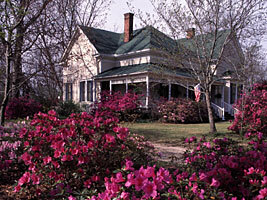 This house served as headquarters for Confederate officers in the area during the Civil War. In addition, the house was acquired around the turn of the century by Laura Stephenson, a prominent citizen of the community and compiler of Clarke County’s Works Projects Administration source material. It has been owned by her family for almost 80 years. Circa 1895 • Queen Anne III • Main Street. One of the best examples of Spindle-work mode of Queen Anne style architecture in Clarke County. The interior features 14-foot ceilings and beaded board wainscoting. In the central hall is a spindled frieze. Circa 1850 • Greek Revival • Highway 11. The Brown-Wilson House is architecturally significant in its application of Greek Revival details to the classically inspired form of the structure. One of four antebellum houses in the county of the pyramidal roof with inset gallery type. Circa 1850 • Greek Revival • Second building from southwest corner of South Stonewall and Bridge Streets. Dr. Paul Lee built this house and was living here when the Civil War began. According to local tradition, a covered walkway connected Lee’s house to the Presbyterian Church. Dr. Lee cared for the wounded soldiers at the church. The Lee family sold the house to Charles G. Swan, who came to Enterprise with the Brookpark Lumber Company between 1900 and 1906. Circa 1900 to 1906 • Queen Anne/Free Classical Mode • Third building from southwest corner of South Stonewall and Bridge Streets. The Swan-Mitts house was constructed on the site of the E.B. Gaston Homestead that may have dated from the late 1700’s. L.J. and Olive Swan came to Enterprise from Minnesota with the Brookpark Lumber Company and built this house sometime between 1900 and 1906. Shortly thereafter, the Swans moved back North. George and Jane Mason and their children, who were another Minnesota family associated with Brookpark, had moved into the house by 1908. Corrine “Dutch” Mason grew up in this house, and by 1919, she and her husband F.W. Mitts, Sr., had purchased the property. F.W. Mitts, Sr., was a prominent business and community leader. “Dutch” Mitts was a businesswoman and civic and political leader in Clarke County. 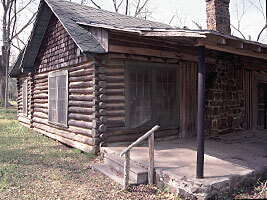 The Taylor Smith Cabin (circa 1920), built by and was the residence of an African-American named Taylor Smith who was the butler of F.W. and Corrine “Dutch” Mitts; a smokehouse (circa 1855), which is a single-pen log building; a carriage house (circa 1855); and a barn (circa 1855). Circa 1898 • Greek Revival • East Enterprise Historic District. 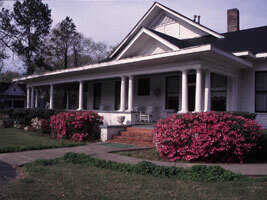 A two-story antebellum home originally built by the Pauley family from Minnesota. Some distinguishing features include double parlors with French doors and transoms. Circa 1850 • Greek Revival • Stonewall Street. Circa 1850 & 1877 • Greek Revival • Second building from the northeast corner of Church and South Stonewall Streets, East Enterprise Historic District. 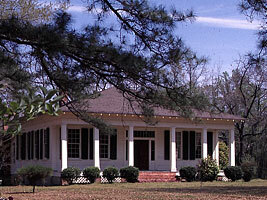 As originally constructed by William Johnson, the house was a one-story, Greek Revival cottage with a central hall plan. The house passed through many owners until 1887 when it was purchased by R.M. Buckley, a prominent Enterprise merchant and cotton buyer. At that time, the house was a two-story structure with a two-tier, front gallery. In 1899, a front wing with a large birthing room was added. The wing was later removed. Circa 1855 • Greek Revival • Southwest corner of Bridge and St. John Street, East Enterprise Historic District. 1874 • Gothic Revival • Approximately 500 feet north of St. John and Bridge Street and intersection, east side of St. John Street, East Enterprise Historic District. Located in the woods on St. John Street, St. Mary’s is a chaste gable-oriented, frame building with Gothic arched, stained glass windows. The one-story, three-by-four bay church, rests on high brick piers. Both a water table and a plain frieze encircle the church. The interior of the church was completed circa 1855 and features wainscoting of vertical beaded board and walls of horizontal beaded board. Circa 1850 • Greek Revival • Highway 514. Pilgrim’s Rest is architecturally significant in its application of Greek Revival details to the classically inspired form of the structure although the roofline has been altered and the rafters exposed. 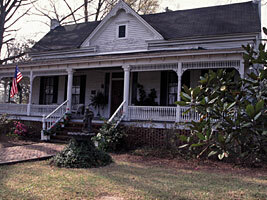 The Compton-Short House’s historical significance is attributed to its Civil War associations. It is architecturally significant as one of two “costal cottage” type houses in the country. During the Civil War, the small room at the northwest end of the house was used as a stockade when fighting erupted between two Confederate regiments of General O’Farrell’s brigade camped near Enterprise. The only entrance to this room is from the front gallery. The house is now named “September Song” by the present owner, Sue Horton. One story, three-by-two bay building of log construction. Circa 1896 • Queen Anne/spindlework mode • Second building from southeast corner of Bridge and St. John Streets, East Enterprise Historic District. Elaborate form of the Queen Anne cottage. Designed by Fred Bushman of Meridian for Helen Wahrendoff.